March Madness is all about compelling stories that captivate a nation of sports fans, many of them only now tuning into college basketball. Texas Tech and Virginia are perfect. The Red Raiders are making their first-ever Final Four appearance, possess the nation’s most suffocating defense, are coached by a sound bite machine who admits to loving Whataburger, and were led, at least late in Saturday’s win over Gonzaga, by an Italian-born player whose parents flew across the pond to watch him. Meanwhile, the 'Hoos and Kyle Guy rebounded from their historical early exit last season—falling to a 16 seed in the first round—by advancing to the school’s first Final Four in 35 years with an unusual defense, methodical offensive style and, holy moly, a classic of a quarterfinal game against Purdue that will go down in Big Dance lore. So one half of the Final Four is in. Joining the Big 12 and ACC regular-season champs will be at least one SEC team (Kentucky-Auburn meet Sunday) and another ACC squad (Duke) or the Big Ten regular-season and tournament champs (Michigan State). One of the better stories of them all might just be the Red Raiders, a No. 3 seed which just four years ago had a decade-long NCAA tournament drought going. In three short years, Chris Beard has turned Tech into a juggernaut—consecutive Elite Eights—built on the nation’s stingiest defense, a unit on display against the country’s top scoring offense Saturday. Tech kept the 'Zags 11 points below their nation-leading field goal percentage (53.2) and 19 points short of their nation-leading scoring offense (88.8 ppg). And Beard’s team forced 16 turnovers, 5.5 more than Gonzaga's average. Just four years ago, Beard was working at Arkansas-Little Rock making $260,000 in salary. He’s made $600,000 in bonuses alone this year. That salty defense of his is coordinated by an ex-boxer and minor league hockey general manager, Mark Adams, whose office is full of candy and whose incentives for his defenders include a WWE-style deflection belt and a UM-inspired rebound chain. And let’s not forget about the players. 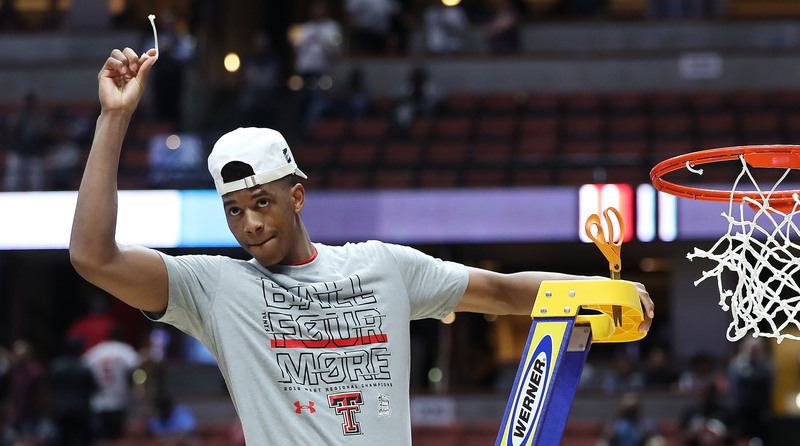 Sure, potential lottery pick Jarrett Culver is the star, but how about the absurd block-and-save by Tariq Owens of a three-pointer with 56 seconds left that iced it? And what about Italy native Davide Moretti? He got a steal and sank two threes in the final four minutes in front of his parents, who arrived from Italy earlier this week surprising their son. His mother saw him play Thursday for the first time ever in America. And then there’s Virginia. The top-seeded 'Hoos beat Purdue 80-75 in overtime in what can easily be described as the tournament’s best game so far. Virginia won despite being down three points with five seconds left while at the free throw line (right?) and allowing Boilermakers guard Carsen Edwards to score 42 points, 30 of which came off three-pointers (in fact, his 28 threes set an NCAA tournament record, and he did it through just four games). Tony Bennett’s team needed an offensive rebound off a purposely missed free throw followed by a buzzer-beating 12-foot floater from Mamadi Diakite to send it to overtime. There were four lead changes in overtime alone. It was wild. It was awesome, and it’s what March is all about—great games, great stories, great nights like Saturday. SI's Ross Dellenger makes his picks for Sunday's two-game Elite Eight slate. No. 2 Kentucky over No. 5 Auburn: The Tigers have won 11 straight, but they’ll be without leading rebounder Chuma Okeke (12.0 ppg, 6.8 rpg), and the Wildcats have PJ Washington. No. 2 Michigan State over No. 1 Duke: Zion Williamson aside, the Blue Devils haven’t looked great lately, barely escaping in their last two tournament games. Zion will have a Zion moment. OK, so we’re not really walking out on a limb here. This might be the last time we see the 6'7", 285-pound transcendent player participate in a college basketball game, and he’s sure to give us one of those viral two-handed slams or amazing alley-oops. Auburn coach Bruce Pearl is known for his emotional presence on the bench. His fiery passion is normally a magnet for television cameras. On Friday night, in a postgame interview with CBS, Pearl’s emotions turned tearful when he spoke about injured 6'8", 230-pounder Chuma Okeke, who tore his ACL in the second half of the Tigers’ win over North Carolina to advance to the Elite Eight. "He’s hurt. He’s hurt, but we’re going to rally,” Pearl says, choking back tears.